Today, of all days, it seems a difference of opinion is what it’s all about. But I’m not here to talk politics! I did get drawn into a Facebook conversation about unicorns and Pegasus. (I know — my geeky side is about to shine). Someone argued that a winged unicorn must be called an alicorn. I beg to differ. Alicorn is indeed a term sometimes used for a winged unicorn, but I believe the word means the horn of a unicorn. Originally, it appears alicorn comes from the Italian alicorno, alicorne meaning “unicorn.” And alicorno, alicorne appear to have their origins in a Latin word for unicorn: unicornis. (And I just confirmed what many have thought, I was one of the weird kids who chose Latin as my “language” in middle school and high school). Alicorn remains a really cool word, just as the idea of a unicorn’s horn as a cure for poison is most magical. Alicorns or unicorn horns also appear on various coat-of-arms and other insignia, as well as in spell books and healer’s journals of long ago. 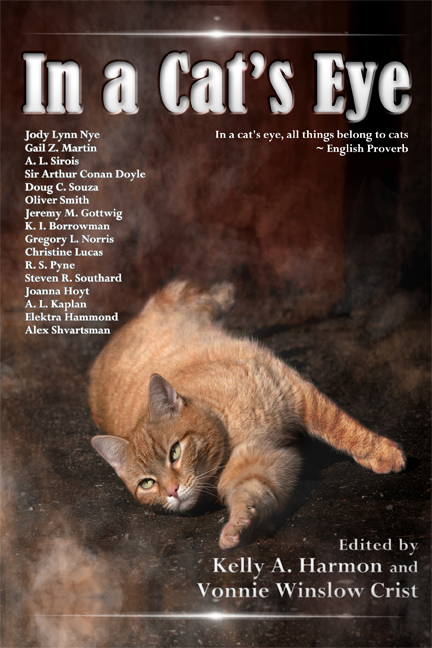 Which brings me to the first review of “In a Cat’s Eye,” the marvelous anthology of cat stories I recently edited (with Kelly A. Harmon) for Pole to Pole Publishing. I’m delighted with the review, and thank NerdGirl and NerdGirl Vamp for a wonderful review. Alas, one of my favorite stories in “In a Cat’s Eye,” the reviewer, while saying it was good, didn’t really get. Oh, no! But then I pause — language, politics, editing, and reviews all benefit from a difference in opinion — even if we don’t see it at first. For how boring this world would be if we were all alike. We received hundreds of stories, and had to turn down some good cat tales. But the 16 stories which share the final table of contents provide a fun and satisfying read for cat lovers and fans of speculative fiction. And I can honestly say, there are a couple of stories in In a Cat’s Eye, I wish I’d written! (Which is the highest compliment I can offer). To read a bit more about some of the stories and their authors, here’s a link to a fascinating post on the blog of one of the contributors, Gregory L. Norris. You can find out more about the thoughts behind the cat stories of Gail Z. Martin, Oliver Smith, Steven R. Southard, KI Borrowman, Christine Lucas, Doug C. Souza, AL Sirois, AL Kaplan, and, of course, Gregory L. Norris. If you, a friend, or family member loves cat stories or science fiction and fantasy, In a Cat’s Eye just might be the book for you. Here’s a buy link, just in case.